Podcast of oaklandsocialist discussing this and related issues. 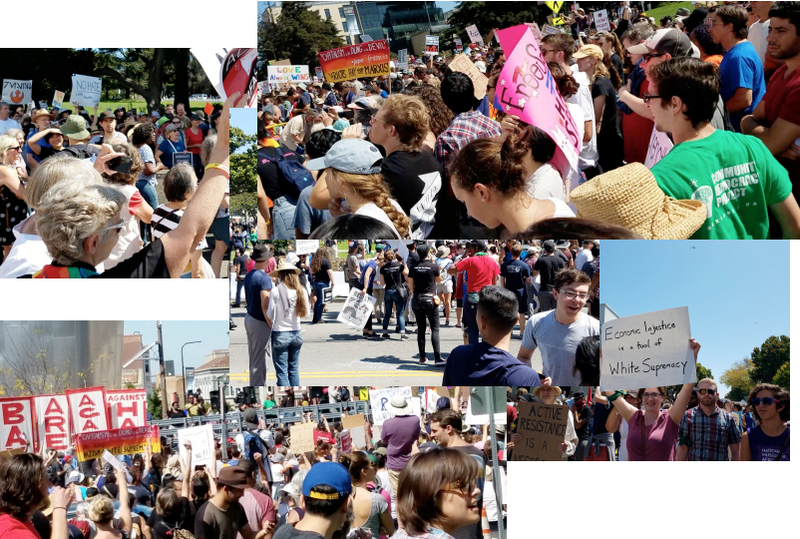 The role of antifa at the anti-fascist/anti-Trump supporters demonstration in Berkeley on August 27 is getting wide attention. But that role can only be understood in its more general political context. anybody even notices it anymore. There are two main reasons for that absence: First is that the “progressive”/liberal wing of the Democratic Party does not want the social disruption of these protests. They also support the police. And the union leadership takes its political marching orders from this wing of the Democrats. Unfortunately, even the socialist left in general refuses to discuss this role of the union leadership. They never raise it when they speak and they don’t raise it in their newspapers. Instead, the speakers usually content themselves with thunderous condemnations of racism, sexism, income inequality and sometimes even capitalism itself. What also never gets raised is: What is the general path, the general trajectory, that the movement has to follow if it is to advance? What are the next concrete steps to be taken along that path? 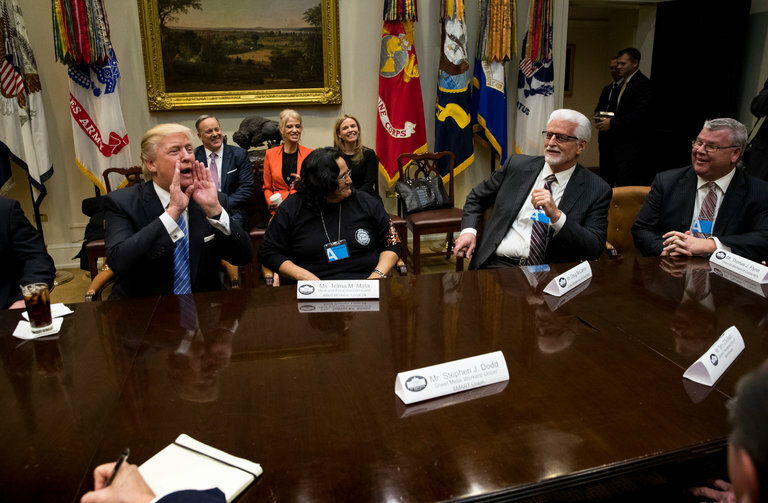 Building trades leaders with Trump. Carpenters president Doug McCarron is second from right. They are not the only union leaders who have posed with Trump. US working class; one in which the US working class hardly exists as an independent political force. This is despite the increasing anger and frustration among millions of workers. The reason for this confusion is the absence of an organizing center, one which explains all issues from a class perspective; that it is up to the working class to resolve the problems. Such an organizing center can only be a mass working class political party. Flowing from that, the question poses itself: What are the next specific steps that can be taken to start to resolve this deafening absence. 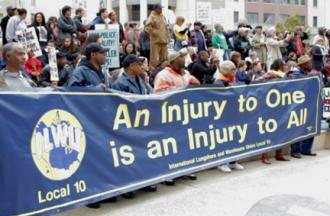 If the unions had a real presence in these protests, that would transform the movement. mass presence, this would completely flip the script. It would start to really clarify the question: That the far right, including but not only the fascists, represent the interests of Corporate America, the US capitalist class, and that the left represents the working class. In other words, the class issue would start to emerge much more clearly. These are the sorts of issues that never get discussed. It is part and parcel of a general lack of serious discussion within the left on perspectives, program and strategy. This leaves a huge vacuum, and that vacuum tends to get filled with the Nike approach: “Just do it!” In other words, action. Any sort of action. It doesn’t matter where the action leads. What comes next doesn’t matter. Just do something, anything. And those who feel the most strongly should commit the most extreme actions is the view. That inevitably leads to physical attacks against the right wing on the part of some. We have to be clear: Not all – or even most – Trump supporters are fascists. The evidence is that at least in some areas, some 30% of union members who voted voted for Trump. Not all of these workers are committed racists and chauvinists. It would be impossible to even propose trying to drive them out of the work places and out of the unions. Some of them can be argued with, reasoned with. Those who cannot, who are firmly committed to Trump’s methods, have to be defeated politically. In other words, their influence among their fellow workers has to be minimized. This can only be done by defeating their arguments. The same methods within the working class and within the only mass working class organizations in the US – the unions – have to be used in the wider movement. The Trumpsters have to be defeated politically. This cannot be done by beating them over the head. This guy was chased away after he tear gassed some people, according to reports. If so, he represents an immediate physical threat. But not all Trump supporters are necessarily fascists. groups. 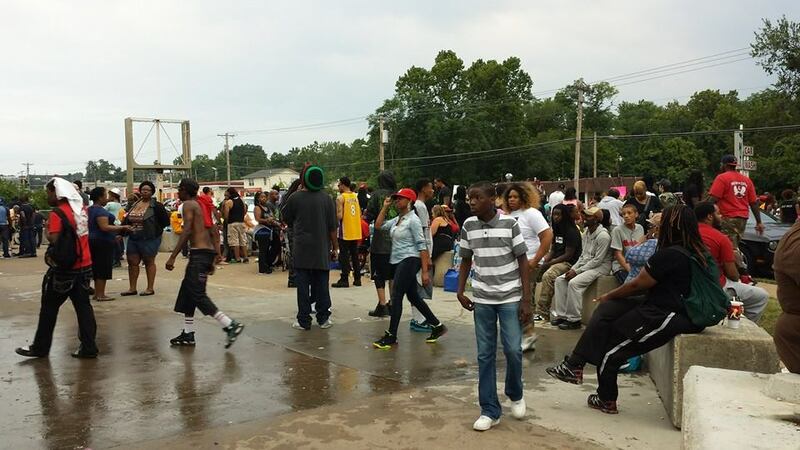 Their gatherings are not just to express a point of view; they are to mobilize to attack black people, other people of color, gays, etc – and the left (including the unions). The issue of “free speech” is irrelevant here. 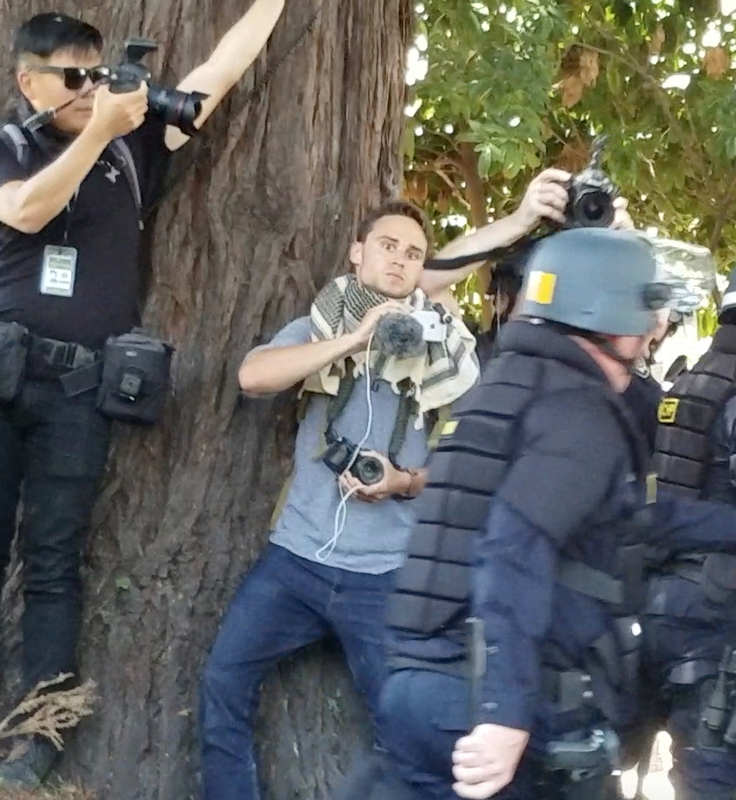 But even in this case, while their presence cannot be tolerated, socialists should oppose beating individual fascists to the ground, as happened in Berkeley on Aug. 27. Simply removing them, driving them away through force of numbers is much more appropriate. Instead, what approached mob violence was used. These same methods in the future could be used against those on the left who oppose these tactics. Not only that, but no distinction was made between just the general supporters of Trump and the out-and-out fascists. There is another mistake being made: At both the events of last weekend, the issue was posed almost exclusively as being one of racism against black people. Of course, in racist America, all pro-capitalist politics involves racism to one extent or another and this must be openly opposed. But that is not the only issue. In Charlottesville, for example, (which was an actual fascist gathering) racism was the rallying point. But let’s remember that their two chants were (1)”Jews will not replace us!” and (2) “Blood and soil” (a general fascist chant). And the young woman killed was part of an attack on the left in general. Similarly, the planned right wing rally in Berkeley was planned as a rally against “Marxism”. And historically, we must remember that before the Nazis started killing the Jews in Germany they first killed the Communists. All of these issues need an open discussion as the background to discussing the role of Antifa. Here are the two signs we carried at the Berkeley rally. 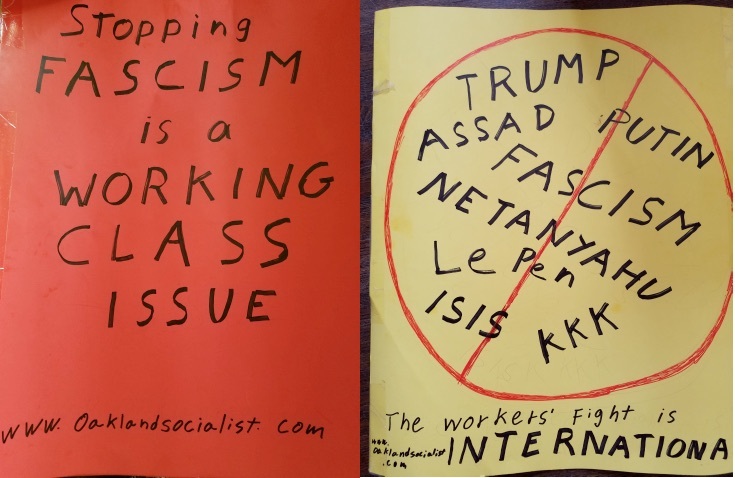 The one on the right is a reminder regarding those socialists and socialist groups who directly or indirectly support Assad and Putin, as well as about the Zionists who come out to oppose anti-Semitism but defend Zionist racism in Israel. Antifa risk their lives to defend against fascists others need to step up as well. Ivy Rose: Thanks for writing. There is some good in most groups on the left, antifa included. However, the fascists and the far right racists will not be defeated with an apolitical approach. This is the criticism of not only antifa for the counter protests in general, as expressed in this article.